Arsène Lupin III and amateur sleuth Shinichi Kudo, aka Conan Edogawa, become involved in an investigation into the death of Queen Sakura and Prince Gill of the kingdom of Vesparand. Conan’s best friend and would-be love interest, Ran Mori, is a dead ringer for Princess Mira. Shinichi (or Jimmy in the English dubbed version) Kudo, aka Conan Edogawa, is from Gosho Aoyama’s manga Detective Conan (aka Case Closed) and its anime adaptation. Philip José Farmer identified Lupin III’s grandfather, Arsène Lupin, as a Wold Newton Family member, and therefore this crossover brings Conan Edogawa into the CU. 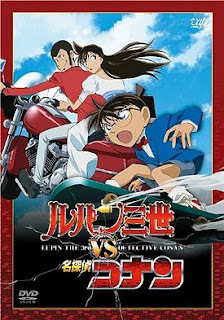 Lupin and Conan encounter each other again in the film Lupin III vs. Detective Conan: The Movie.